what's truly amazing is that something coming from halfway round the world can get here so fast, but something that's simply shipped stateside hasn't even made it yet! Just received this blanket. It is super high quality. Everything you expect from WPG. May get another. Well made, great weight and comfortable. I have to order another one, however. Can't seem to get the first one back from the wife!! It's her go to blanket now in the winter. Excellent made product! 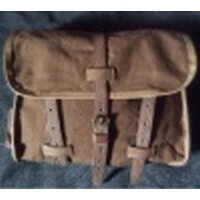 I have been needing one of these since I bought the Model 1878 Blanket Bag. The price was right and the blanket is soft and well made. No threads are pulling loose. The hem is professionally stitched. I now have a brown Civil War emergency-type blanket, this blue one, and an OD-7 blanket. I am covered for all of my 1863-1973 impressions. Thanks, Jerry, for remembering to make these for us. Very impressed with the quality of this blanket! I may have to get another and use on my bed at home. Thanks Again Jerry!